This high-performance, multi-functional HDMI audio extractor can extract the audio signal to the amplifier system. Thereby obtaining a good audio effect which TV speakers is difficult to achieve. 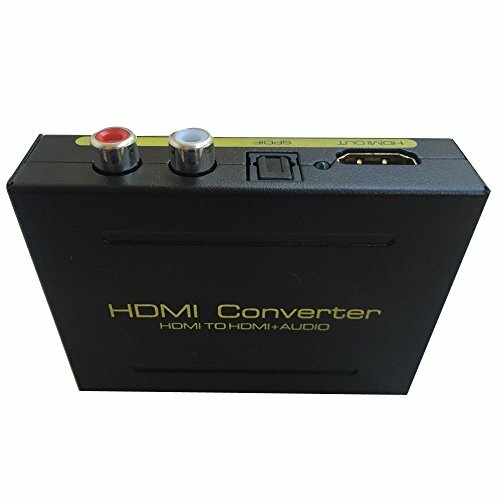 The HDMI to HDMI converter allows the HD Source connected to single HD Display and adds extra one L+R and SPDIF audio out port. Our devices offer solutions for noise, space and safety concerns, data center control, information distribution, conference room presentation, school and corporate training environments. It can extract the digital 2CH PCM stereo audio signal from the HDMI input and convert it to 2CH analog stereo output through its RCA style L/R analog output AND SPDIF output at the same time. The SPDIF output can support 5.1CH audio including Dolby Digitla 5.1CH and DTS 5.1CH. Please note it does NOT support Dolby Digital Plus and PCM 5.1CH and beyond. Premium Quality:HDMI Supports Full HD 1080P, 3D and 36-bit deep color; HDCP & CEC Pass Through. Audio EDID Settings: 2CH for L/R or SPDIF stereo output; 5.1CH for SPDIF Output, Supports uncompressed audio such as LPCM. If you have any questions about this product by AbleWin, contact us by completing and submitting the form below. If you are looking for a specif part number, please include it with your message.